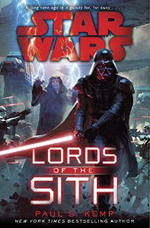 Lords of the Sith is a decent entry in the Star Wars universe with a familiar setup but good execution. As this takes place before Episode IV, we know this story has many limitations that Kemp works within well. We get a good amount of action both in space and planet-side and a surprising amount of insight and introspection from Darth Vader along the way. The beginning feels like so many others that have come before: random resistance/rebellion is causing trouble and the Empire must respond. 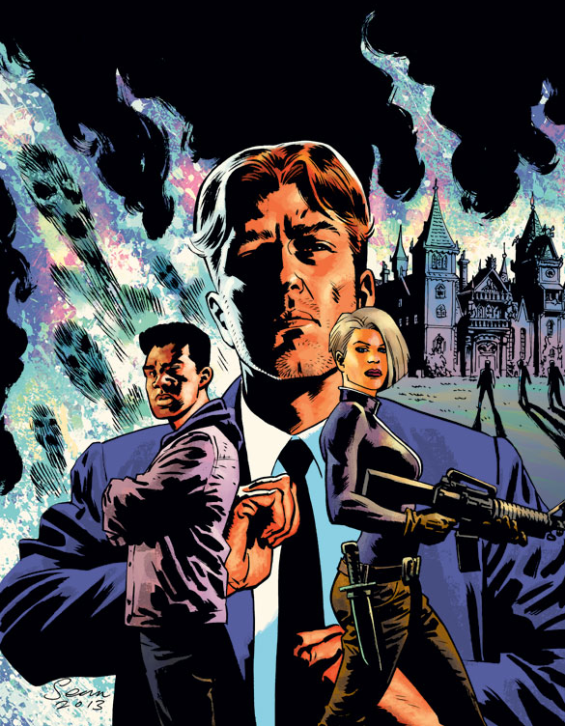 If more books are written in this time period, I really hope some oter source of tension is found because the perpetual rebellions are getting kind of tired (not to say that shouldn’t be happening but there were far more creative issues hitting the New Republic in the expanded legends universe). A lot of time is spent developing characters and their reason for a rebellion that we know won’t be sticking around very long when I really want to see more of the Sith. I kind of felt the same way with the time spent on characters I didn’t care about in Kenobi when I wanted more of the wizened old Jedi Master. Thank goodness that lightens up a good way into the book. Things really start to get interesting when Vader and the Emperor show up to shut things down in a Star Destroyer only to suffer a pretty crazy attack prepared by the resistance. I enjoyed this part because of Kemp’s clever usage of many of the different technologies and capabilities seen in Star Wars over the years. It was also fun to see Vader flying around in a craft with limited capabilities with only the Force as his weapon. How do you kill a jedi or a sith? Lots and lots of back up plans would give you a shot! Speaking of using the Force for a weapon, we really get to see Vader and the Emperor unleash a bit on their abilities in this novel. Early on, Vader infiltrates a ship on his own and is scary efficient at cutting his way through everyone on board. It’s kind of like when they storm the blockade runner in Episode IV except just Vader running through the place taking people out. We also get to see the two sith working in tandem to face all kinds of scenarios that range between cool/plausible to just putting random indigenous threats through the meat grinder (that part kind of felt like a, “lets just show how totally badass these guys are by making them kill meaningless things”). There are a bunch of moments where I wondered how they were fooled by something dumb, didn’t just kill someone that was being a nuisance the whole time, etc but overall it was pretty good. The book isn’t all violence and craziness because we get to see Vader struggling with serving his master. Episode III ended with Vader having submitted to Palpatine but their master/servant relationship wasn’t exactly fleshed out by the end of the film. Vader still struggles with the repercussions of previous events and contemplates attacking his master at regular intervals…as every sith should. It’s interesting to hear his thoughts and struggles and knowing what he’ll become. On the audio side of things, Jonathan Davis did a great job as usual and the sound effects/music were great. Jonathan Davis always puts on a great performance with high energy and does not disappoint here. Some of the sound effect got to me – mainly the squelching noises that one would normally associate with a sith crushing enemies or smashing an enemy into a wall, but such sounds should make you cringe. Overall this was not my favorite Star Wars book but was still a decent entry in the universe. If you’re looking for more sith action, definitely check out the Darth Bane book that start with Path of Destruction. My first encounter with the sword-and-sorcery genre came when I discovered Fritz Leiber’s Fafhrd and the Gray Mouser stories, neatly packaged into audiobooks at Audible with introductions from no less a figure than Neil Gaiman. How could I refuse? 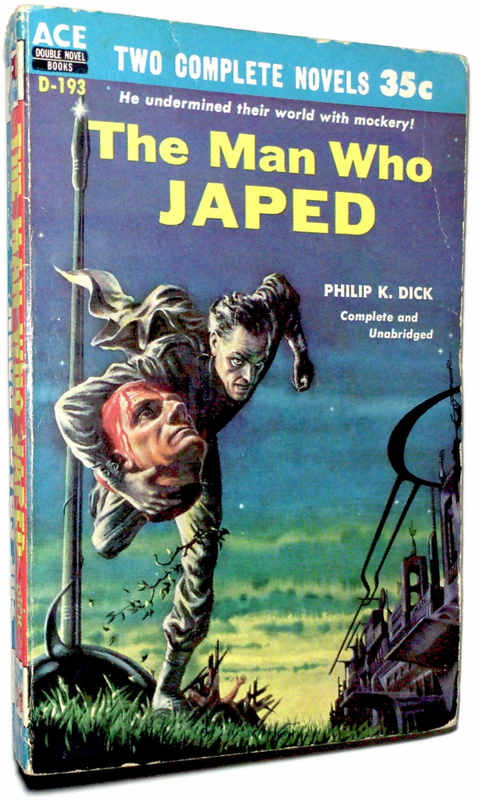 While Leiber’s world-building was top-notch, though, I found fault with his lack of any real character development. Now, I know what you’re thinking: Seth, characters in a sword-and-sorcery novel aren’t supposed to be developed! While I agree in principle that the genre is supposed to thrive on antiheroes like Michael Moorcock’s Elric, there’s a vast difference between making an intentional authorial decision not to develop characters, or to develop them in an unconventional way, and simply neglecting the care and feeding of a protagonist. Of this I found Leiber guilty. So I set the genre aside in hopes of finding a specimen more suited to my predilections. Enter Paul S. Kemp’s Nix and Egil series. The eponymous heroes (it’s almost impossible to call them antiheroes) are, respectively, a sprightly little man of craft and cunning from the slums of Dur Follin, and a hulking, hammer-wielding priest of Ebenor, the momentary God. At first glance, you would be forgiven for mistaking this pair for Leiber’s Fafhrd and Gray Mouser, or, perhaps if you squint, Terry Pratchett’s Bravd and the Weasel. But where Leiber’s adventurers are often gray as the Mouser’s name, Kemp’s likable rogues flash and sparkle like a colored prism, reflecting and refracting their personae as the wheel of the story turns. And speaking of the city of Dur Follin, its twisting alleys, Low Bazaar, taverns, and guild houses are every bit as well-realized as Leiber’s Lankhmar. I rediscovered fantasy in my teens through reading David and Leigh Eddings’s mammoth epics. While I now recognize that much of their work was middling at best, I still admire their capacity to write charming, amusing, and at times poignant dialogue. Kemp has honed this particular skill to a keen edge. The playful, good-natured banter between the two unlikely companions will have you laughing out loud one moment and pondering the mysteries of life itself the next. Their friendship is deep and genuine in the way that so many fictitious friendships simply aren’t. Nix and Egil each have their own past, present, and (it is to be hoped) future. Their hopes, fears, and regrets are writ large in the story’s pages, and this emotional element propels A Discourse in Steel beyond the mark of mere adventure into territory that far too fantasy novels explore. You’ll notice I’ve said nothing of the plot. This is partly because I cordially dislike plot regurgitations in reviews, but also because the plot is, in a sense, unimportant. I don’t mean to suggest the plot is bad. In fact, it’s well-paced, intricate for a novel of this length, and not without its little surprises. But one comes away from reading this book with a sense that the plot served mostly as a backdrop for exploring these two remarkable characters, like set decorations in a theater performance. Of course, if all this emotional and philosophical discussion makes your eyes glaze over, and you just want to read fun stories of swashbuckling adventure, fear not, A Discourse in Steel has them in spades, or hammers. As you can probably tell by now, I am more captivated by the character development, and sometimes felt the plot barged in on a real moment of heart, but I confess that most readers will find the novel’s plot and pacing perfectly measured. The novel isn’t without its faults. Nix and Egil are masterfully developed, but the book’s other dramatic personae, with a couple no notable exceptions, lack that same fit and finish. The villains, in particular, come across as fairly one-dimensional, even though they get a lot of stage time. Rusilla and Merelda, the tale’s damsels in distress, fare slightly better, especially towards the end, but as the series title suggests, this is the Nix and Egil show. The novel also flags a bit once the plot maneuvers the characters out of the stress of Dur Follin, which as a city is complex enough to be a character in its own right. To paraphrase one of the characters, Nix and Egil seem to belong in Dur Follin, and watching them out of their element, like fish out of water, takes a moment’s adjustment. The book’s last fault, if you could call it that, is that it ends too soon, leaving several key questions unanswered, questions about Egil and Nix, questions about the city of Dur Follin, and questions about the wider world beyond. The audiobook is narrated by Nick Podehl, who, to me at least, has become synonymous with epic fantasy in audio, thanks in no small part to his narration of Patrick Rothfuss’s Kingkiller Chronicles. His bag of vocal tricks just seem to be a natural fit for the genre. He is able to glide smoothly between Egil’s rumbling curses and Nix’s falchion-sharp witticisms, and during the action sequences his sense of timing is impeccable. Podehl is the narrator equivalent of what’s called in Hollywood a character actor. 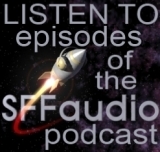 He lacks the star power and name recognition of a Simon Vance or a William Dufris, but if you’ve listened to many audiobooks recently, you’ve probably heard his voice. He certainly does justice to Kemp’s work. 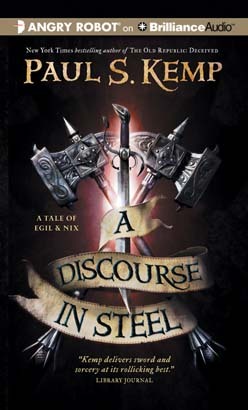 A Discourse in Steel is the second Nix and Egil adventure, but it can be read on its own, though its predecessor, The Hammer and the Blade, is nearly as good. I’m grateful to the efforts of Paul S. Kemp and his creations Nix and Egil for showing me that the sword and sorcery genre can embody both style and substance. Maybe it’s time I revisit Leiber and the other S&S greats; maybe I’ll find they’re not as soulless as I thought. Egil and Nix have retired, as they always said they would. No, really – they have! No more sword- and hammer-play for them! But when two recent acquaintances come calling for help, our hapless heroes find themselves up against the might of the entire Thieves Guild. And when kidnapping the leader of the most powerful guild in the land seems like the best course of action, you know you’re in over your head. When I read The Hammer and the Blade, the first Egil and Nix book, I had a good time with this buddy-sword-and-sorcery (is that redundant?). The characters were entertaining if a bit melodramatic, the action spot-on, and the writing professionally done. A Discourse in Steel exceeds The Hammer and the Blade on just about every level (probably even the melodrama). I thoroughly enjoyed Discourse and a lot of that could be because I’ve gotten to know the characters that much more. 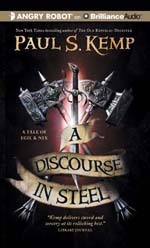 First, you have to know that A Discourse in Steel is more a second Egil and Nix book than a sequel. Yes, it follows the The Hammer and the Blade in both publication and timeline, but the events in Discourse are self-contained just like those in Hammer. In fact, you don’t need to know anything to jump into this book. “Conceded.” Nix said, with a tilt of his head. I had to pull over and write that one down. This also means any mistakes are mine although I’m sure I got all the words right. And since I “read” the audio version, I have to comment on Nick Podehl. This was my first read by him and this guy seemed made for the duo that is Egil and Nix. He was hilariously sarcastic and blended the melodrama well too. It’s actually quite interesting because Nick is reading my current book which is very serious. At first, it didn’t work because I was used to the fun and sarcasm, but now I can’t even believe they’re the same person. Nick is an excellent narrator, I’ll be happy seeing his name on audiobooks in the future. Speaking of that, I’m looking forward to reading more of Kemp’s work in the future too. I can’t believe he balances four kids, a corporate attorney position, and writing. Plus, he finds time to discuss on reddit.com/r/fantasy and other places where fans congregate. A Discourse in Steel is exactly what it claims to be. It’s tons of fun with plenty of action and while it doesn’t take itself too seriously, it knows when to be serious. Kemp stepped up his game and I’m looking forward to more adventuring with Egil and Nix.